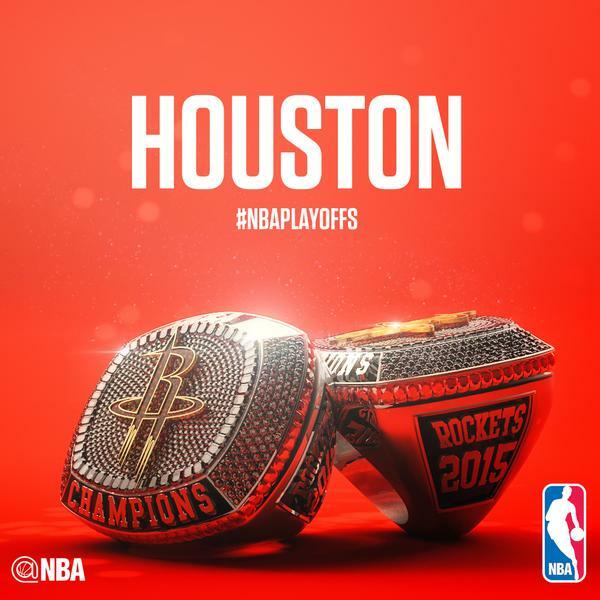 For the first time ever the Houston Rockets are southwest division champions. They finished the regular season at 56-26, the third best record in the league, bettered only by Golden State and Atlanta, who ironically are the only two teams the Rockets did not beat this season. The 56 wins are the third most in franchise history, but the franchise has made it out of the first round just one time in the last 17 seasons. Here is the schedule for the Rockets and Mavericks first round playoff series. Some early notes to get the blood pumping for the Rockets-Mavericks first round series. – Houston is 1-9 in their last ten playoff series and has just one series victory in the last 17 seasons. 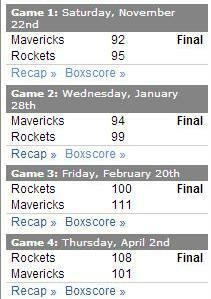 The last time these teams met in the playoffs was 2004-2005 and Jeff Van Gundy was the Rockets head coach. No confirmation from ESPN yet, but he’ll surely be one of the color analysts for at least a few games in this series on ESPN/ABC. Three players from that series are still around to play in this series. DIrk Nowitzki and Devin Harris are still with the Mavericks, while the Rockets Jason Terry was with Dallas in that series. It’s a 40 minute flight to Houston from Dallas. It’s a 60 minute flight to Houston from Oklahoma City. Before the 1st meeting, Houston had two days off and no travel. Before the 2nd meeting, Houston had two days off after returning from Los Angeles. The 3rd meeting was Houston’s first game out of the all-star break. Before the 4th meeting, Houston played at home the night before travelling to Dallas. 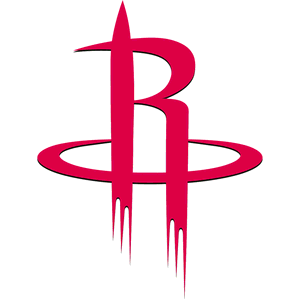 – Former Rockets and current Mavericks forward Chandler Parsons has not played since he left the game against Houston on April 2 with knee discomfort, missing the final six games of the season. He left that game with just over four minutes remaining in the third quarter and the Mavericks were up six points at the time. Houston would outscore Dallas, 42-29 the rest of the way for the come-from-behind victory. Parsons also was unable to finish the previous meeting between the two teams, in that instance with a sprained ankle. 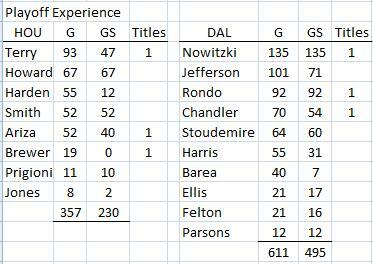 The Mavericks got their only win against Houston in that game, but that injury cost Parsons the next seven games. (Dallas was 7-5 in those 12 games he missed). His first season in Dallas was fairly similar to his three seasons in Houston. He shot 46 percent from the floor after shooting 47 percent with the Rockets. He made 38 percent of his 3-pointers with Dallas, after making 37 percent of his 3-point attempts as a Rocket. His numbers against Houston were a notch down from how he performed against the rest of the league. He averaged 15.9 points per game and 4.9 rebounds in his 62 games against the rest of the league. 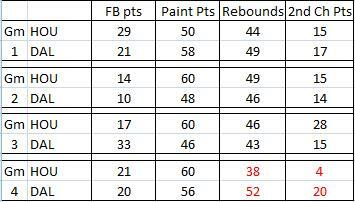 His numbers against Houston in four games are shown in the chart below. – Monta Eliis shot under 40% FG in three of the four games against Houston and made only 2-of-19 3-pointers in the four meetings. – Rajon Rondo averaged seven points, five assists and 4.5 turnovers in three games against Houston as a Maverick. In the game on January 28, Rondo played 34:23 without scoring a single point. That’s the most minutes he’s ever played in a game without scoring. He’s played in 573 games in his nine year NBA career. 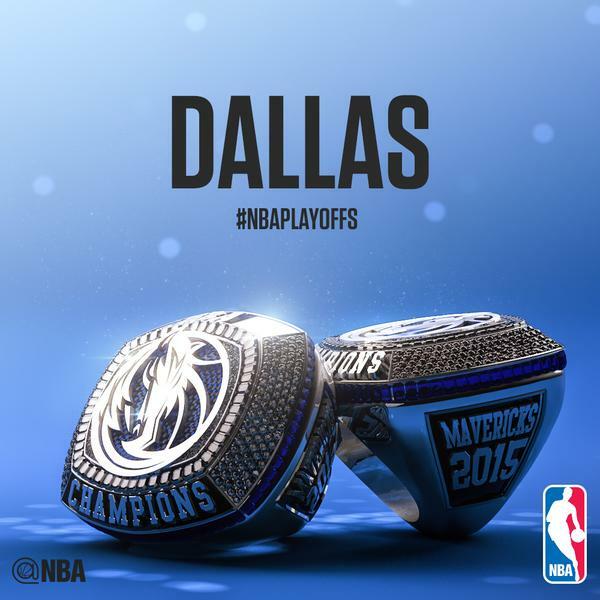 – Al-Farouq Aminu was one of the few bright spots for the Mavericks in their season series against the Rockets. He was a menace in the final three meetings. Houston just simply could not get a body on Aminu to keep him off the glass and he was a great rim-protector. His high-energy could be a huge boost for Dallas. Definitely an x-factor candidate for this series. 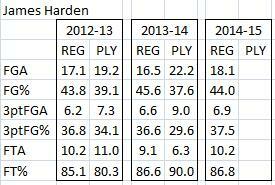 Just one early note on the Rockets regarding the return of their big man in the middle. – Dwight Howard missed all but one of the four games against the Mavericks. He scored eight points and grabbed seven rebounds in 18 minutes of play. However, it was the only game in the nine he played since his return from injury in which he made fewer than half of his field goals (3-7 FG). played in nine games after returning from his knee injury. He played in 32 games prior to the injury timeoff. 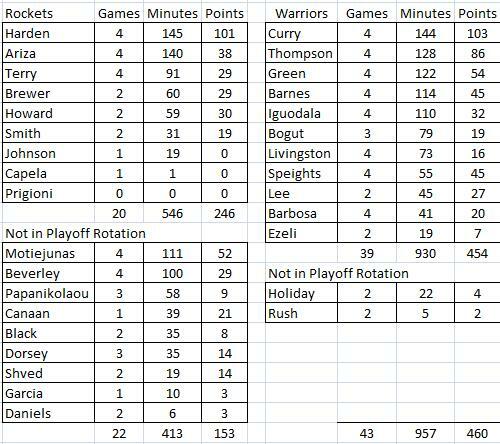 His per 36 minutes averages before and after the knee injury were dramatically different in a good way for the Rockets, who appear to finally have a healthy Howard. 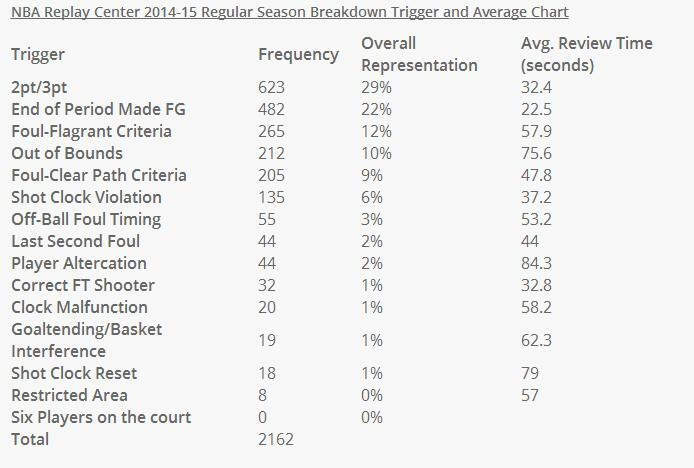 Something else to look at regarding Howard’s return from injury is looking at his shot charts and shooting percentage. He’s attempted 72 shots since returning from the injury – all but one from right at the rim basically. 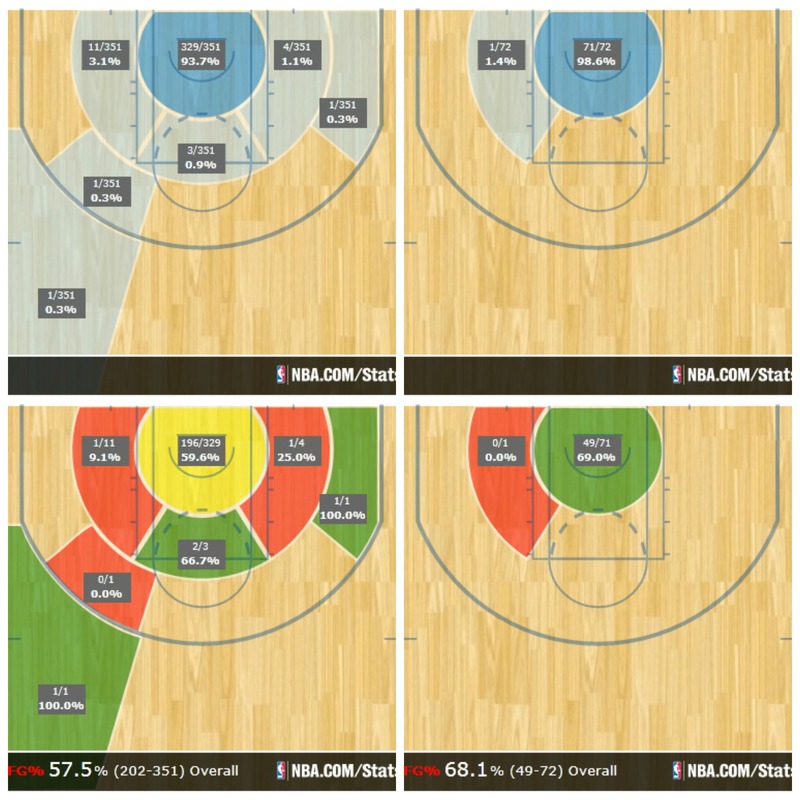 The shot charts on the left are before his injury absence and the charts on the right are after his return. Much more coming throughout the days leading up to Saturday’s game one.